Unilever’s latest romantic short film for its Unicornetto ice cream in Indonesia, titled “90 Days of Hiding My Feelings”, is based on its global campaign tagline “Don’t Try Too Hard”. Conceptualised in Singapore and executed in Indonesia by online entertainment platform Viddsee, the six-minute film targets 13 to 21-year-old consumers. The plot was guided by Viddsee’s insights into its audience and romantic content, and further augmented with Unilever’s insight that perfectionism and fear of failure among teenagers was on the rise. The light-hearted short film, which centres on a budding relationship in college, encourages teenagers to be less anxious when confessing their feelings, with the ice cream brand representing a simple and fun way to share a romantic moment. To market the film, Unilever used dynamic creative management and serving platform Jivox to create multiple six-second and twenty-second video clips from the full six minute film that capture the key moments of an early romance. Each clip was then micro-targeted to the relevant audience segment. Jivox employs algorithms that combine audience data signals and creative elements in real-time to deliver according to Unilever’s precision marketing strategies. The month-long campaign, which began on 29 December, saw the clips being distributed by Unilever across a variety of digital channels including Facebook and Instagram, with a link to watch the full video, and a call to action which drives consumers to purchase product at the stores. According to regional brand development manager Pantira Chotchaisathit, the company was able to create fun and enjoyable content that was true to the insights from its target consumers regarding their journey to love. 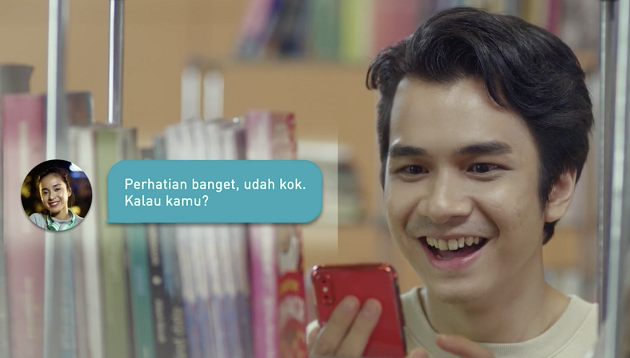 “And using the insights gained from our research arm and AI-driven technology, we created a multiple precision marketing assets from a single piece of content that not only drove engagement, views, and efficiently landed the message, but also gave us a deeper understanding of how Indonesian teens are consuming content,” she added. O&M will continue to promote French films in 2017 through a partnership with independent cinema and creative platform The Project..